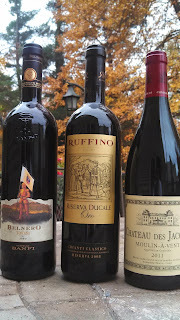 The final wine we received this winter from The Wine Chateau was the Castello Banfi Belnero 2010 ($28). This family owned winery has a unique story of perseverance as the patriarch's (John F. Mariani, Sr.) family was forced to return to Italy from American and lived with his aunt Teodolinda Banfi - who in time became the "guardian" of the papal apartment of Pope Pius XI. After returning to America, Mariani Sr. opened a wine house, Banfi Vinters, in Old Brookville New York in 1919 - just in time for Prohibition a year later. He survived by "importing spices and other Italian specialties as well as the manufacture of medicinal bitters, an alcohol product permitted under the new law". After repeal, Banfi began importing Barolo, Gattinara, Brunello and Chianti Riserva wines and eventually introduced Lambrusco to the U.S. market. In 1978, Mariani Sr's sons John Mariani Jr. & Harry Mariani opened the Castello Banfi vineyard estate, in Montalcino, Tuscany. The Belnero is made from Sangiovese grapes, with small amounts of Cabernet Sauvignon and Merlot - all harvested in estate vineyards, on the southern hills of Montalcino. The aroma and flavor exude black fruit - plums and blackberries - with a sold structure of chocolate and tobacco. The wine has a long, tannic finish leaving the flavors to fuse throughout the palette until the next sip. This is a very nice wine, and with patience will improve even more over time. 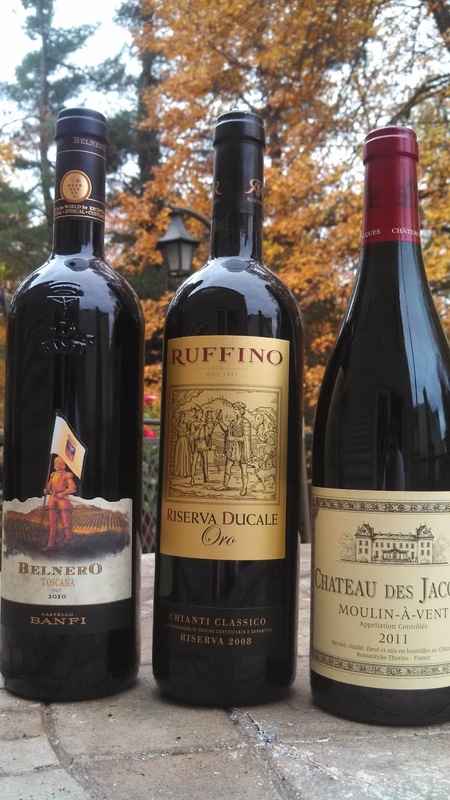 Thanks Wine Chateau for this wine as well as the Ruffino Chianti Classico Riserva Ducale Oro Gold and Château des Jacques Moulin-à Vent. Cheers.